Israel is ongoing with the infrastructure work, which includes roads and homes in the so-called E1 area, in east Jerusalem in order to impose its own vision of any future peace deal by disconnecting geographical contiguity of the Palestinian territories and linking Maali Adumim illegal settlement with East Jerusalem and other settlements around it. Israel planned this construction initially in 1994, and in 1999 the Higher Construction Committee approved the plan but was not implemented due to American pressure. 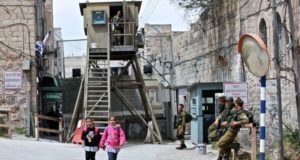 In May of 2008, Israel constructed a police station in the area and went on to pave roads, main junctions, public squares, checkpoints, a bridge, side walls, and other constructions with a total cost that exceeded 100 Million New Israeli Shekels. Israel also paved a road which links Khizma Palestinian town with Al Zeaayim area in order to be used by the Palestinians as they will not be allowed into the E1 area. The plan will further bloc any contiguity between Jerusalem and Ramallah. Israeli Prime Minister, Ehud Olmert, said after he won the elections in March of 2006 that he intends to construct and expand settlements in the E1 area and vowed contiguity between the settlements and Jerusalem. This includes Gush Azion settlement bloc and Ariel settlement bloc in the southern and northern parts of the West Bank. On Saturday, Israeli online daily, Haaretz, reported that Olmert’s office declared that Ma’aleh Adumim settlement bloc is and will remain part of Jerusalem under any peace agreement. The settlement as well as all Israeli settlements and outpost are built on Palestinian lands illegal annexed by Israel. 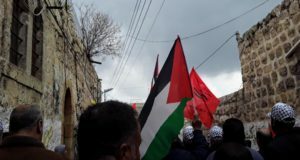 Under the current plan, Israeli will build a new settlement on 12442 Dunams that would be annexed from the Palestinians living in Al Ezariyya, AL Toor and Al Esawiyya. It will contain 3500 housing units (for nearly 14500 settlers). Also, ten hotels, recreational facilities, other settlement units, and an industrial zone would also be built under this plan. Meanwhile, Israeli Defense Minister, Ehud Barak, said that Ma’aleh Adumim is an inseparable part of Jerusalem and the state of Israel. Haaretz reported that Barak’s office issued a statement saying that Ma’aleh Adumim will be linked with Mount Scopus and that it “is absolutely necessary to keep the area as part of Israel. This was the same position of former Israeli Prime Minister Yithak Rabin, who was killed by an extremist Jew in 1995, as well as the position of consecutive Israeli government since East Jerusalem fell under Israeli occupation in 1967. Ma’aleh Adumim is built on Palestinian lands in East Jerusalem, it lies 14 kilometers to the east of the city and is inhibited by more than 30000 settlers. The E1 project will ensure the expansion of the settlement and linking it with Jerusalem by annexing more Palestinian land from villages and towns in East Jerusalem. The plan will cut off any possibility of developing Palestinian villages and cities in the area, and will block geographical contiguity which threatens the possibilities of establishing a viable Palestinian state with East Jerusalem as its capital. The plan will prevent Palestinian construction between Jerusalem and Ramallah and will complicate the situation and make it difficult to reach an agreement on borders. Israeli settlements in the occupied Palestinian territories, including East Jerusalem and its surrounding Palestinians areas, are illegal under the international law since they are built on occupied lands. 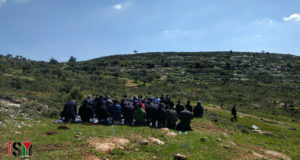 Yet, construction and expansion of illegal settlement remains the first priority of consecutive Israeli governments and the Palestinians continue to lose lands, olive orchards, and their villages, cities and towns continue to be isolated and separated by settlements and the illegal Annexation Wall.